One day a bus pulled up outside Petra´s house, carrying a large group of overseas travelers wanting to see the collection. Some of them had to relief themselves after a long drive and soon there was a que outside the family´s toilet. The guide must have felt things were moving to slowly, because he told Pertra that she´d have to make some radical changes in the lavatory department. Petra answered, cool as a cucumber: "I´m not so sure. There are only the three of us living here and one toilet is enough." For forty years Petra received tens of thousands of visitors in her home and allowed them to look at her stones for free. Many thought they were in a public museum when they were in fact at this generous woman´s home. Through the years, people urged Petra to charge her visitors a nominal fee but she refused, claiming that the stones belonged no more to her than to other people in Iceland. Few years ago she finally agreed to accept money from visitors when she was faced with the task of erecting the Story Hut in her garden. Today the visitors number between twenty and thirty thousand each year and that makes Petra´s the most popular tourist destination in East Iceland. Once, when Petra and her friend, Þórdís Ásmundsdóttir, went on one of their many stone-collecting expeditions together, they went to Fáskrúðsfjörður. After a few hours walk in the mountain without finding anything of value, they decided to head home. After driving a fair distance they decided to stop because "nature called" them both, or as Petra said it: "We had to pee, which is not uncommon." They parked their car and walked a short distance down to the beach where rocks obscured the view from the road. Petra picked a place where a rather large rock was lying on the beach and held onto it for support. While there, she started to examine the rock more closely and it appeared to her that it had recently broken off the cliffs above and she gave it a knock with small stone. The rock spilt open and a magnificent quartz came to view. The two "stone ladies" then hurried back to the car to fetch a sack into which they placed the rock in order to carry it back but that turned out to be very difficult. Even if the distance was short, it was hard work to get the rock back to the car, mainly because of its weight and the lay of the land but also because they laughed so much about how they found the stone. Petra and Þórdís agreed that they couldn´t have carried it much further than they did that day and were therefore very happy that they´d found it such a short distance from the road. It should not come as a surprise that this beautiful stone is now known as the "Urine stone." 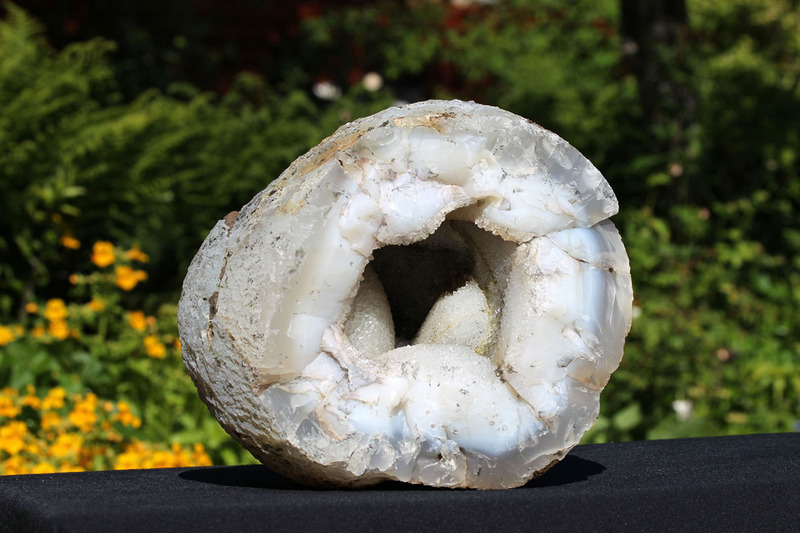 Petra found this magnificent Chalcedony and Quartz in one of her most productive stone-collecting areas, shortly after 1960. At that time, Petra had to take care of three children and she had to take them with her when she went looking for stones in the mountain. On this particularly fine day, Ingimar, Sveinn and Elsa Lísa followed their mother and with them were four friends. For a lot of reasons, this was a day to remember. The weather was excellent and nature was at it´s most beautiful. When the little group had scaled the hills on the fjord´s northern side for a while, they came upon a fox´s den. Excitement ran riot when the den was examined but the fox was out. After the group reached their destination, only a short while passed before Petra laid eyes on this magnificent stone. But now she was faced with a problem. The stone was too large and too heavy for her to carry it but she was also reluctant to leave it behind because she feared that another stone collector might stumble upon it while she returned to the village for strong backs. So, Petra rolled the stone a fair distance until she found a suitable crevice where she placed the stone and covered it with earth and moss. It was evening when Petra came home with the children but she went back as soon as she had found men to carry the stone. They put it into a hessian sack and lowered it down off cliffs with ropes and by doing so, saved a lot of time and made carrying it a simpler task, but still physically taxing. It is difficult to place the stones in this extraordinary collection in order by merit, but Petra had no doubts; this stone was her favorite. But that was not because she found it the prettiest; it was because of that memorable day. "The weather and nature, being with the children and the excitement involved with bringing the stone home make it so special."